Inspired by the remarkable success of the UTokyo Forum 2013 held in Santiago and Sao Paulo (Nov 2013), the First Chile-Japan Academic Forum at UTokyo was held a year later in Tokyo (6-9 Oct 2014). The Second Chile-Japan Academic Forum at Patagonia was held in Chile (7-10 Nov 2016) as a follow-up activity to further encourage the strong research collaboration long taking place between Chile and Japan in different areas of knowledge. The forum was proposed as a biannual activity taking place alternatively in Chile and Japan. 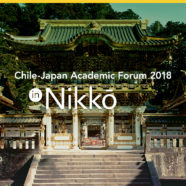 As a result, the Third Chile-Japan Academic Forum in Nikko will be held in Tochigi Prefecture, Japan (25-28 Sep 2018).